Lovely two bedroom property in a quiet location in Ibiza with a private pool, roof terrace and air conditioning. 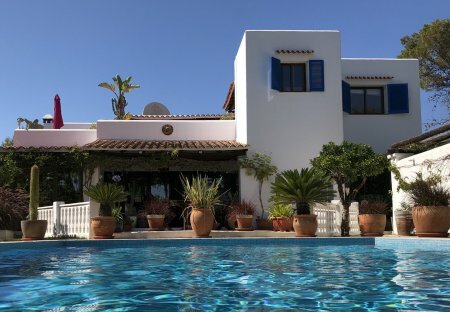 Located in Santa Eulalia Del Rio and only a short walk to numerous beaches. This 4 bedroom villa with private pool is located in Sa Carroca and sleeps 8 people. It has WiFi, air conditioning and a garden. The villa is near a beach. Beautiful, spacious, renovated finca. Ideal for large families and retreats.